One of the ancillary services Pink Castle Fabrics offers in its brick and mortar store is the use of the store's Accuquilt Go, at the rate of $5/hour. Now, I am a firm believer in the use of a fabric cutter for cutting tiny or repetitive (or both) pieces, and the Go is a nice one. 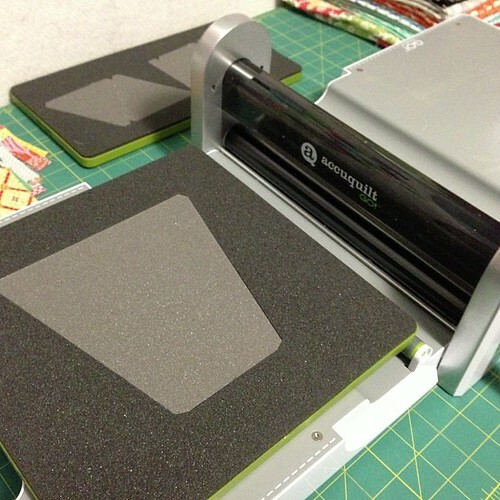 It can accommodate dies large and small, and up to 6 layers of fabric. This is a huge time saver! And less time spent cutting is more time spent sewing (and ironing, can't seem to shake the ironing). Getting the Go ready to cut some tumbler blocks. In case you have not used one before, they are pretty straight forward (and fun!) to use. You set the die of choice down on the feed tray, put your fabric on top of that (lining the grain lines up to the front of the die's blades) and put a cutting pad on top. This whole thing you roll through the machine, which presses the fabric on to the blades of the die, and on the other side it comes out cut! You can watch a video here, on the Accuquilt website. I would recommend ironing your fabric before you arrive, and bringing a few things with you: a cutting mat, ruler, and rotary cutter (especially if you are cutting a lot of fabrics, or have large pieces, you may want them to be trimmed to size so that they won't drag as they are rolled through the machine - the other option is that you can wrap the fabric around the die, but you will not be able to cut as many layers then) and a pair of scissors to free any pieces that don't get cut all the way through, which will happen occasionally. Another good thing to remember is that you are free to mix pieces cut in with a die with pieces cut the usual way or cut any which way. Or recut your cuts to achieve a size or shape that isn't available. For my current quilt I am shaving half an inch off some half square triangles units; because the die isn't quite the right size for my needs. 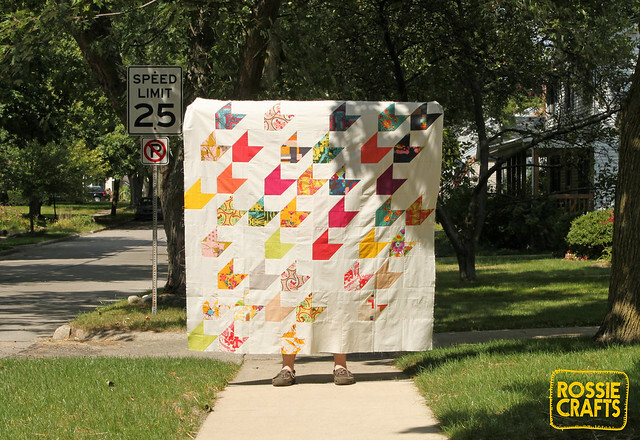 You are limited only by your imagination, and tools such as this are just to save a little time on the road to your dream quilt. Squares - 2", 2.5", 3.5", 4.5", and 5"- the size of the square die is the size of the square. Half Square Triangles - 2", 4", 6", and 8" finished - cut they are 2.5", 4.5", 6.5" and 8.5"
Isosceles triangle - 5"x6" - this is the size of the triangle before accounting for seam allowances. Triangle in a Square - 3" finished block - in a quilt it would be a 2.5" block. It cuts the isolese triangle for the center and the two right triangles for the sides (though you have to cut half your fabric right side down and the other half right side up if you want an equal number of the two.) 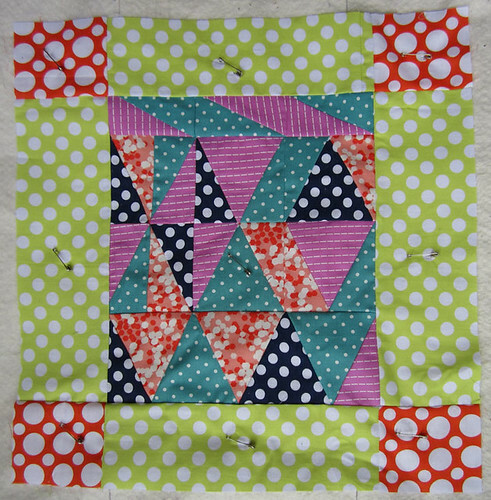 The Accuquilt website also has a few suggestions on what blocks and designs can be made with this versatile die. 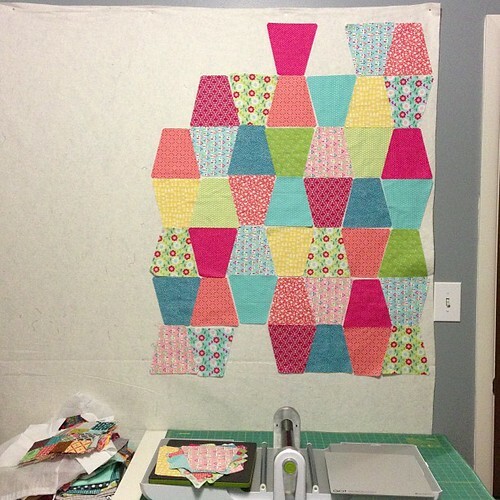 The interior of this not yet quilted mini was pieced from triangle in a square pieces. Tumblers - 3.5" and 6.5"- this measurement is the height of the tumbler. by this color scheme called candy buttons. Parallelogram - 1.5" x 2.13"
If you are not local (or if you are) and have your own Accuquilt cutter, Pink Castle also carries some Accuquilt dies in the store. Brenda likes the big dies. 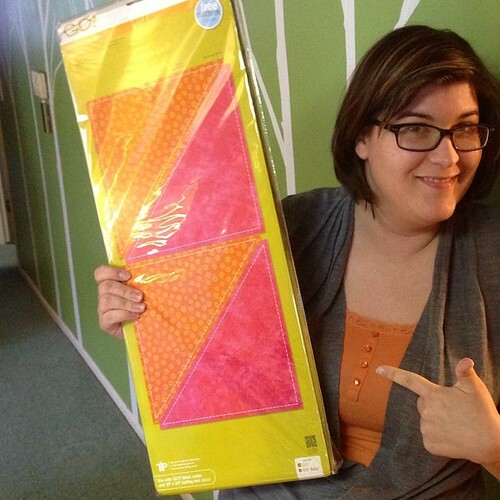 No matter how you cut them out, we'd love to see your projects in our Flickr group Made With Pink Castle Fabrics!